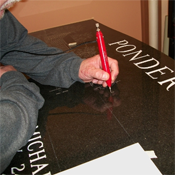 One of our customization techniques involves etching a memorable image or created scene directly into the granite. 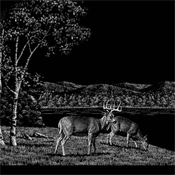 Etchings can be done by laser or by hand, depending on the image and stone quality. Unlike a laser etching which is performed by a machine, a hand etching is done personally by hand by an artist, directly onto the stone. 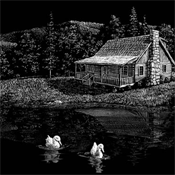 As such, its resemblance to a photo image or a sketched scene will only be as good as the artist's impression of the image. Regardless of whether it's done by laser or hand, these etchings will not fade and will last forever. Simply provide us with the image and we will make it last forever.